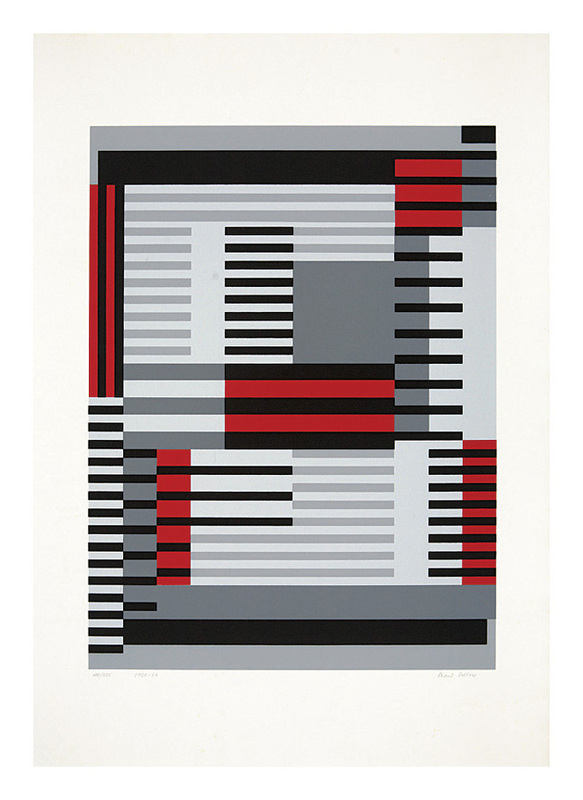 Anni Albers was born in Berlin in 1899. 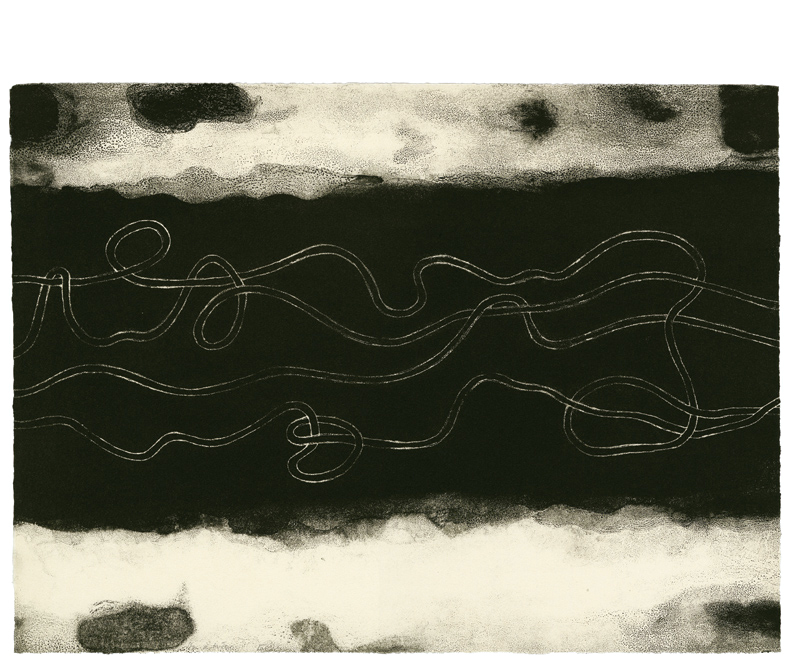 She studied art first with Martin Brandenburg in Berlin and then for a year at the Kunstgewerbeschule in Hamburg. 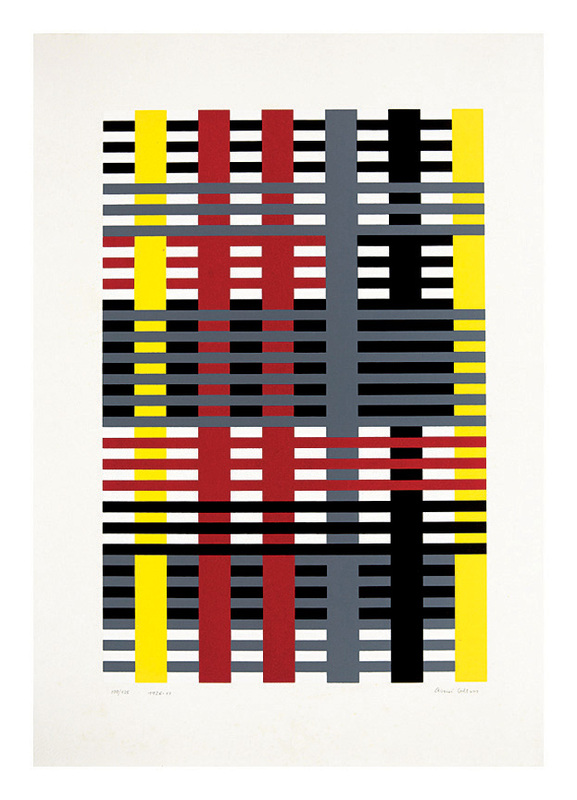 In 1922 she entered the Bauhaus at Weimar to study weaving. She completed her course at the Bauhaus at Dessau in 1929 and taught there, in the fabrics’ section, from 1930 to 1933 when, the Bauhaus having been closed by the Nazi regime, she emigrated to the United States with her husband, Josef Albers, and accepted an assistant professorship at Black Mountain College in North Carolina. In 1937 she became an American citizen. 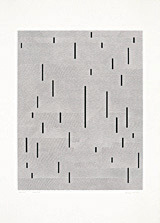 Massachusetts Institute of Technology (1959); Carnegie Institute, Pittsburgh (1959); Baltimore Museum of Art (1959); Yale University Art Gallery, New Haven (1959); Colorado Springs Fine Arts Center (1959); Contemporary Arts Museum, Houston (1960); University of Bridgeport (1971); Kunstmuseum der Stadt, Düsseldorf (1975); Bauhaus-Archivs, Berlin (1975); Brooklyn Museum, New York (1977); Queens College Library, New York (1979); Monmouth Museum (1979); Hartford Art School (1979); Mattatuck Museum, Waterbury (1979); Graphic works by Anni Albers are to be found at European and American museums: Art Gallery of Ontario; The Center for Graphic Arts, University of California, Los Angeles; The Israel Museum, Jerusalem; Kunst museum der Stadt, Düsseldorf; Metropolitan Museum, New York; Museum of Modern Art, New York; St. Louis Art Museum; Seattle Art Museum; Wadsworth Atheneum, Hartford; Westfälisches Landesmuseum für Kunst und Kunstgeschichte, Munster; Yale University Art Gallery, New Haven; National Gallery, Washington. 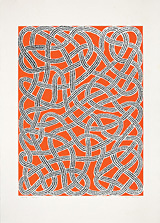 Connections 1925/1983 - - 1925-1983, Portfolio of 9 Serigraphs. Edition 125. Signed, dated and numbered 100/125 in pencil by the artist. Sheet size 27 7/8 x 20 3/8 inches (708 x 518 mm). 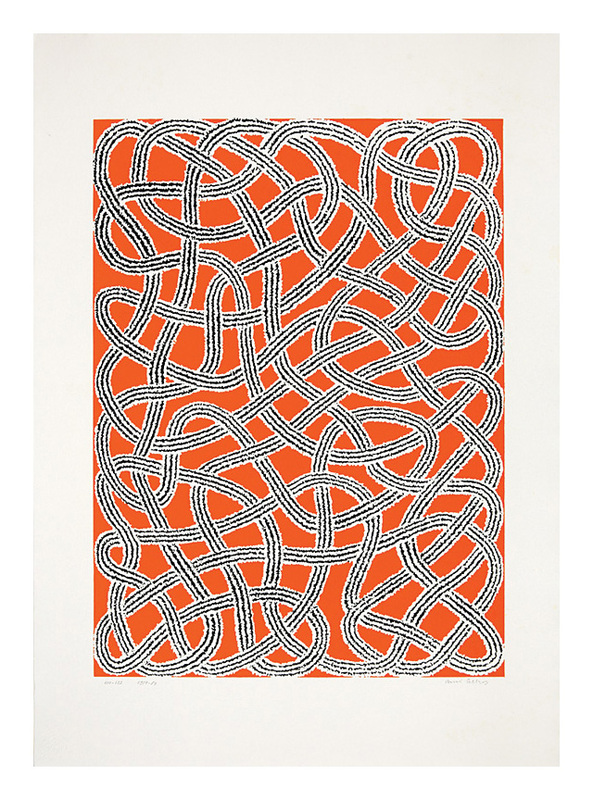 Impeccably executed impressions of nine of Anni Albers' seminal works; with fresh, clean colors, on full sheets of Umbria Italia off-white wove paper. Unobtrusive minor foxing to several of the sheets, otherwise in excellent condition. 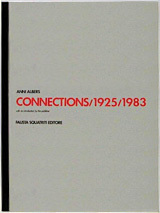 The complete set, loose as issued, contained in the original printed, pressed-board portfolio. 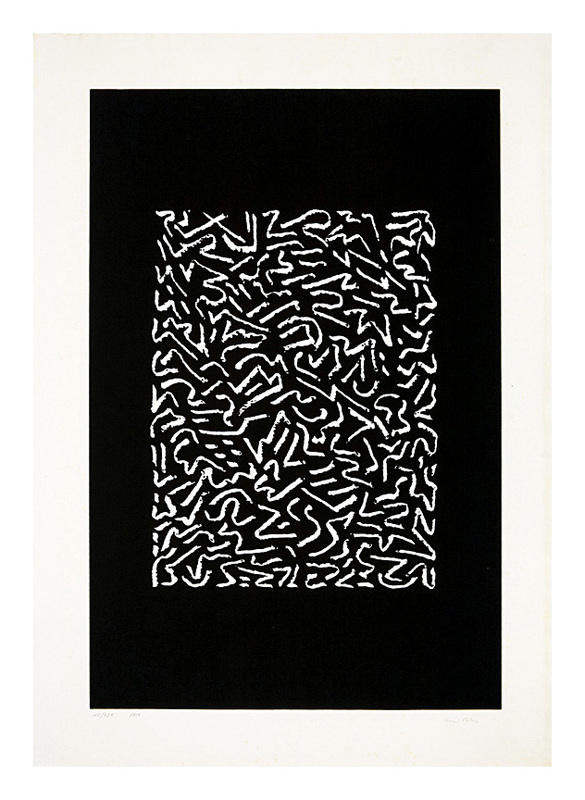 Printed by Samuele Villa, in Milan, 1984. Production supervised by Fausta Squatriti. 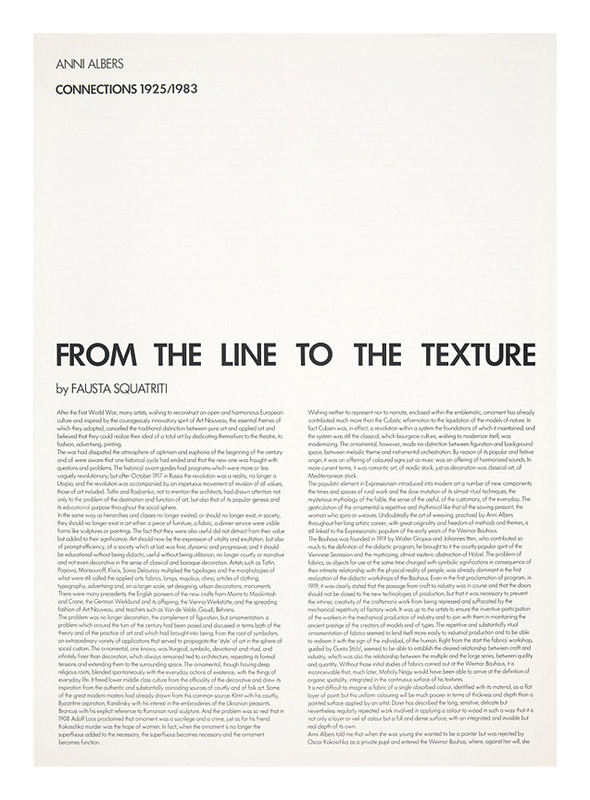 Published by Fausta Squatriti Editore, Milan. 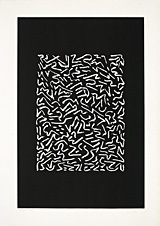 Collections: Asheville Art Museum; Bauhaus-Archiv, Berlin, Germany; Museum of Modern Art. 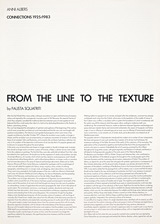 Introduction: From the Line to the Texture---1983, Offset. Written by Fausta Squatriti, translated by Ian Simpson. Printed both sides. Sheet size 27 7/8 x 20 3/8 inches (708 x 518 mm). 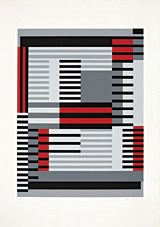 Smyrna-knüpfteppich (Bauhaus-period)---1925, Color Serigraph (matte: black, pale gray, light gray, medium gray, red). Signed, dated 1925 - 83 and numbered 100/125 in pencil. 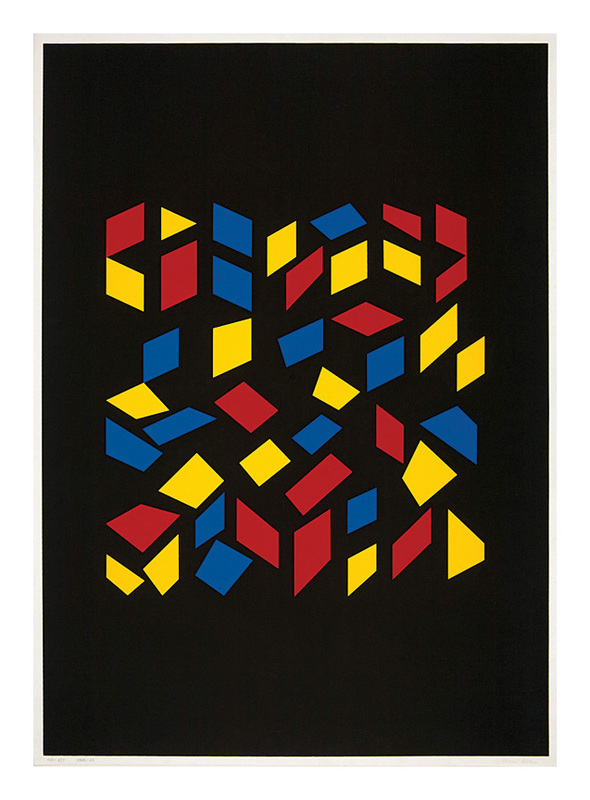 Image size 20 1/8 x 15 1/8 inches (511 x 384 mm); sheet size 27 7/8 x 20 3/8 inches (708 x 518 mm). 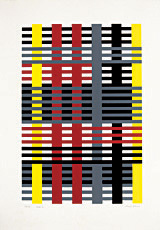 Study for unexecuted wall hanging (Bauhaus-period)---c.1926, Color Serigraph (matte: black, gray, red, yellow). Signed, dated 1926 - 83 and numbered 100/125 in pencil. Image size 21 3/16 x 14 1/8 inches (538 x 359 mm); sheet size 27 7/8 x 20 3/8 inches (708 x 518 mm). 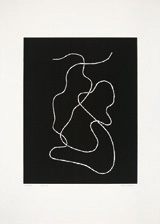 With verticals---1946, Serigraph (matte black). Signed, dated 1946 - 83 and numbered 100/125 in pencil. Image size 19 3/8 x 15 1/8 inches (492 x 384 mm); sheet size 27 7/8 x 20 3/8 inches (708 x 518 mm). Signed, dated 1948 - 83 and numbered 100/125 in pencil. Image size 17 5/8 x 13 11/16 inches (448 x 348 mm); sheet size 27 7/8 x 20 3/8 inches (708 x 518 mm). 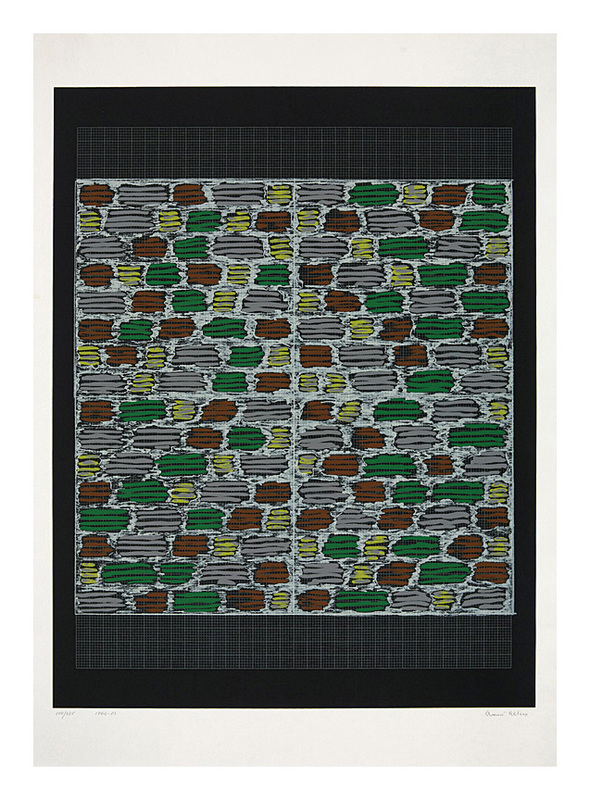 Study for nylon rug---1959, Color Serigraph (matte: black; orange). Signed, dated 1959 - 83 and numbered 100/125 in pencil. Image size 20 5/8 x 15 3/16 inches (524 x 386 mm); sheet size 27 7/8 x 20 3/8 inches (708 x 518 mm). 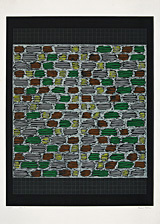 Study for hooked rug---1964, Color Serigraph (matte: black, off-white, taupe, lime, sienna, green; metallic silver grid). Signed, dated 1964 - 83 and numbered 100/125 in pencil. Image size 23 x 17 7/8 inches (584 x 454 mm); sheet size 27 7/8 x 20 3/8 inches (708 x 518 mm). 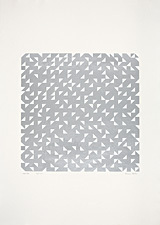 Triangulated intaglios---1972, Color Serigraph (metalic silver; matte white). Signed, dated 1972 - 83 and numbered 100/125 in pencil. Image size 14 1/4 x 14 1/4 inches (362 x 362 mm); sheet size 27 7/8 x 20 3/8 inches (708 x 518 mm). 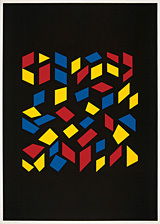 Orchestra III---1980, Color Serigraph (matte black; glossy: red, yellow, blue). Signed, dated 1980 - 83 and numbered 100/125 in pencil. Image size 26 11/16 x 18 13/16 inches (678 x 478 mm); sheet size 27 7/8 x 20 3/8 inches (708 x 518 mm). Signed, dated 1983 and numbered 100/125 in pencil. Image size 23 1/8 x 15 5/16 inches (587 x 389 mm); sheet size 27 7/8 x 20 3/8 inches (708 x 518 mm). 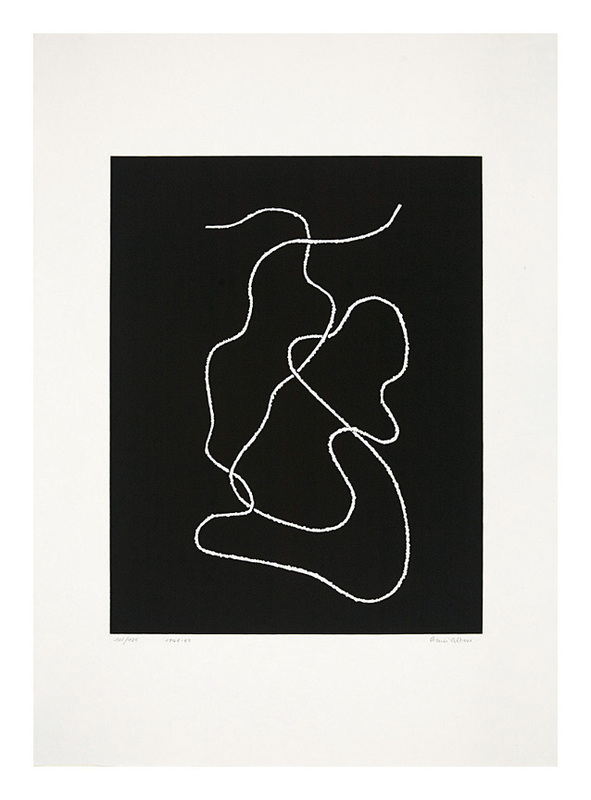 Line Involvement II- - 1964, Lithograph. A bon à tirer proof impression before the edition of 20. Annotated Bon à tirer and signed in pencil at the botom sheet edge. A superb, painterly impression with rich blacks, on heavy cream wove paper; the full sheet with deckle all around—the image printed to the sheet edges, in excellent condition. 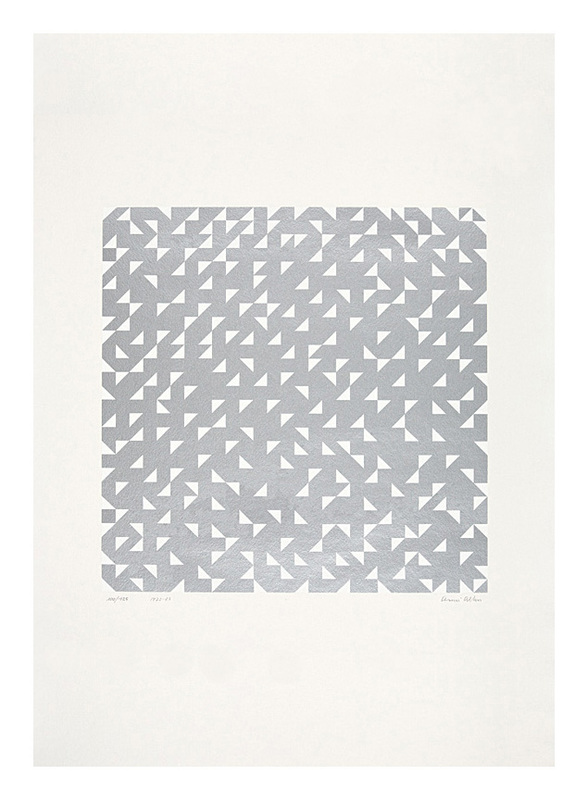 Printed at Tamarind Lithography Workshop, Los Angeles, an institution at the forefront of a revival in fine art printmaking which was taking place in the United States at that time. 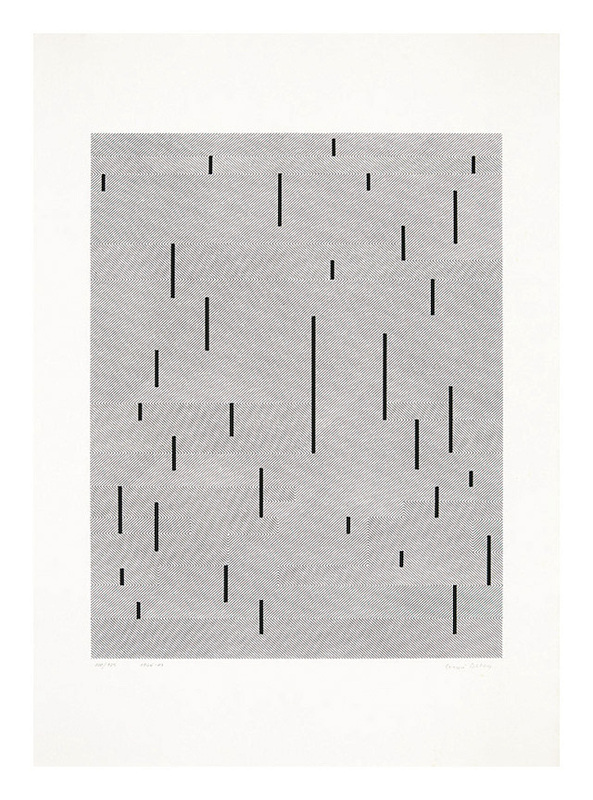 Collections: Josef & Anni Albers Foundation, Kenneth Tyler Printmaking Collection, Museum of Modern Art, National Gallery of Art.